Tsakos Energy Navigation Limited is a diversified tanker company that is well-regarded for its skilled and ethical management. With a stellar record of 42 consecutive quarterly dividends, Tsakos Energy Navigation Limited has demonstrated the ability to reward investors regardless of market conditions. Tsakos Energy Navigation Limited is conservatively leveraged, has a substantial fixed contract backlog and exposure to upward market trends through profit sharing and other arrangements. Common shares of Tsakos Energy Navigation Limited can be acquired at highly depressed values, at a fraction of book cost. Increasing oil supply, coupled with a high scrapping of older tonnage, and a low order book for new vessels, could squeeze the market causing the common shares to spike. These shares present a good investment opportunity for investors who expect an eventual upturn in tanker rates, perhaps as early as year-end 2019. 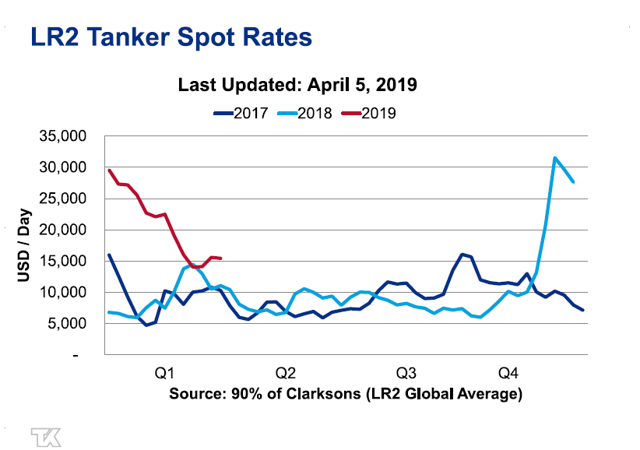 For many months, tanker rates have been mediocre, but there was a spike in the last quarter of 2018 that may augur better times to come. Perhaps the stars will finally align for the tanker shipping industry. 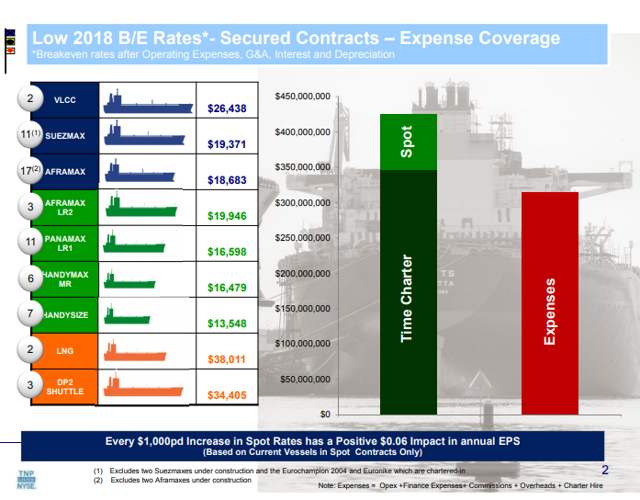 If, as some industry observers anticipate (for a number of reasons, discussed below), tanker rates were to remain persistently elevated, such an investment could be a multi-bagger. On March 29, 2019, Ten Ltd. released its full-year and last quarter 2018 financial reports. 2018 was a particularly difficult year for the seaborne energy shipping industry. Tanker rates slumped throughout the year, although they picked up substantially during the last quarter. Share performance for tanker companies remained generally depressed throughout 2018 and, currently, remains depressed. On a GAAP basis, the company reflected losses for both quarter-end 2018 and for the entire year. For the fourth quarter, net losses were $73.353 million, and for the entire year, net losses were $132.966 million. These losses were in large part the result of financing items, depreciation, and most notably, vessel write-downs. For example, the relatively large GAAP losses occurring in the fourth quarter are mostly the result of a $66 million write-off resulting from five vessels that the company is now "holding for sale". It should be noted that investors purchasing shares at current prices purchase these shares at a heavy discount to book value. At current prices, the shares have a very low price to book ratio of 0.19. This means that heavy asset value write-offs and accounting losses are already implicit in the price currently being paid for the shares. Indeed, it is unlikely that the company would any time in the near future write off the $1.2 billion in common shareholders' equity implicit in the company's current valuation. On an operating or EBITDA basis, the company's financial results were much better. For the fourth quarter of 2018, the company generated $26.3 million in operating income. For the whole of 2018, operating income stood at $38.18 million. Similarly, the company generated $66.27 million and $190.73 million in EBITDA income in, respectively, the fourth quarter of 2018 and 2018 as a whole. Ten Ltd. unlike some of its industry peers is, moreover, unlikely to go bankrupt in the short to medium term, even if recent taker rate weakness continues. As has already been mentioned, the company's future cash flow is anchored by a contractual backlog of $1.2 billion with solid counterparties, mainly major energy companies. Regarding ships in its fleet soon going off charter, management is optimistic about currently ongoing negotiations. Despite industrywide challenges, Ten Ltd. closed 2018 in a strong financial position. At year-end 2018, the company retained strong liquidity in the form of $220.5 million in balance sheet unrestricted cash. Moreover, the company remains conservatively levered. Net debt to capital at the end of 2018 stood at a healthy 47.9%. In this respect, management's continuously cautious attitude towards leverage should be noted. The company does not add speculative or unchartered tonnage and has, therefore, avoided the problems besetting some of its industry peers. Throughout 2018, the company deployed operating cash flow to pay down significant amounts of debt, putting the company in a more even keel regardless of future market conditions. During the year, the company paid down $156 million in debt or $2 per share. Since then, in 2019, the company has paid down an additional $14 million in debt. Ten Ltd. has a diversified fleet consisting of 68 vessels, including vessels in most crude and product tanker size segments, as well as two highly profitable liquified natural gas (LNG) vessels and two D2P shuttle tankers. This fleet is detailed in the chart below. Ten Ltd.'s minimum contracted backlog on these vessels is $1.2 billion, with an average remaining charter duration of 2.3 years. 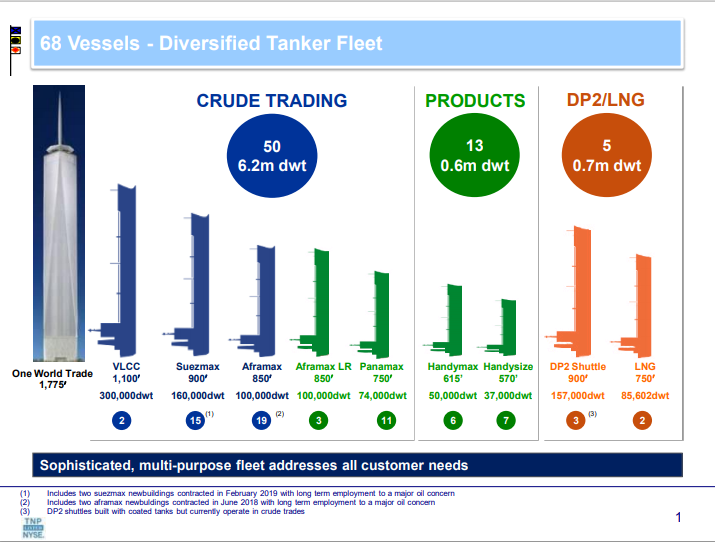 In addition, Ten Ltd. is positioned to benefit from upturns in tanker rates, as 65% of the fleet has upside potential, whether through profit-sharing arrangements, spot chartering, or re-charters. Ten Ltd. is an efficient operator. The company's break-even points for its fleet are relatively low, as detailed below. Its overall fleet utilization rate for 2018 was 96.2%. As a whole, the shipping industry is characterized by rate and asset price volatility, pervasive use of leverage, and, not infrequently, financial chicanery by offshore-based management. Since Ten Ltd.'s initial public offering in 2002, several well-known tanker names have come and gone or been forced through painful financial restructurings, including Overseas Shipholding Group Inc. (bankrupt in 2012), Frontline Ltd. (FRO) (restructured starting in 2011), Omega Navigation Enterprises Inc. (bankrupt in 2011), and General Maritime (bankrupt in 2011). The Securities and Exchange Commission's action against Overseas Shipholding Group Inc. and its Chief Financial Officer for nondisclosure of approximately half a billion dollar in liabilities, the rinse and repeat toxic financings engaged in by Dryships Inc. (DRYS) and TOP Ships (TOPS) in 2016 and 2017 (which are subject in both instances to class actions and ongoing SEC investigations), and the outright fraud engaged in by officers of Aegean Marine Petroleum Network Inc. prior to its bankruptcy filing in 2018, all come to mind. The foregoing incidents have added perhaps to a feeling of jaded cynicism among investors regarding shipping stocks, including energy shipping stocks, which may in part explain chronically depressed valuations even as shipping rates fluctuate or show upward tendencies. They also highlight a point that cannot be emphasized enough. When evaluating shipping companies, it is particularly important to pay close attention to management's financial conservatism, demonstrated business ethics, and track record of returning value to shareholders. Investors in shipping companies are accordingly well-advised to do some due diligence on the personalities behind any shipping company in which they may want to invest. As anything else in life, who you are with matters most. This is a lesson of particular applicability in the shipping industry, which is rife with companies where management manages the company other than in the interest of its shareholders and far too frequently shamelessly and repeatedly engage in myriad shenanigans and conflict of interest transactions that decimate shareholding interests. As George Economou, the CEO of Dryships once famously said of his company's shareholders, "Americans are the dumbest investors around, and there's lots of liquidity in this market." The shipping world does however also have its genteel class. Since inception as a public company in 2002, Ten Ltd.'s principal sponsor, the Tsakos family of Greece, has treated outside investors fairly. The company is well-regarded and has an institutional investor base. As has already been mentioned, the company is a consistent dividend payer, having paid out 42 consecutive dividends. This by itself speaks volumes. An investor purchasing shares at the IPO price would have recovered his or her investment more than one and a half times on dividends alone. The company has moreover never engaged in toxic financing schemes. It has never gone through a bankruptcy process or a restructuring. The Tsakos family has never done business that way. It has not engaged in comparable behavior in other public business ventures. The Tsakos family has furthermore participated in all capital raises for the company, and most notably has never sold any of its common shares. Tanker Rates, Bottoming Out in 2018? The ethical rot exposed in the shipping industry is however perhaps a symptom of persistent weak shipping rates, which over the years have destroyed shipping fortunes. Facing the abyss of insolvency, perhaps otherwise good people engage in desperate actions and cut corners. 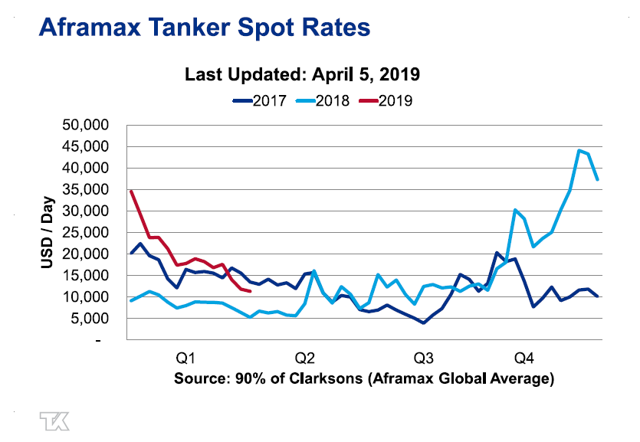 There are good reasons to believe that the energy shipping industry at least has however finally reached an inflection point, with firmer tanker rates on the horizon. The first three quarters of 2018 were characterized by weakness in all major market segments for tanker shipping. Financial and share price performance for most tanker shipping companies was weak. Although tanker rates witnessed large gains in the last quarter of 2018, the share prices for tanker shipping companies have remained depressed. Teekay Tankers (TNK), a more highly leveraged but similarly well run medium-sized tanker company that is part of the Teekay, Inc. (TK) family of seaborne energy companies, offers helpful market commentary on its website, and tracks the development of tanker rates. 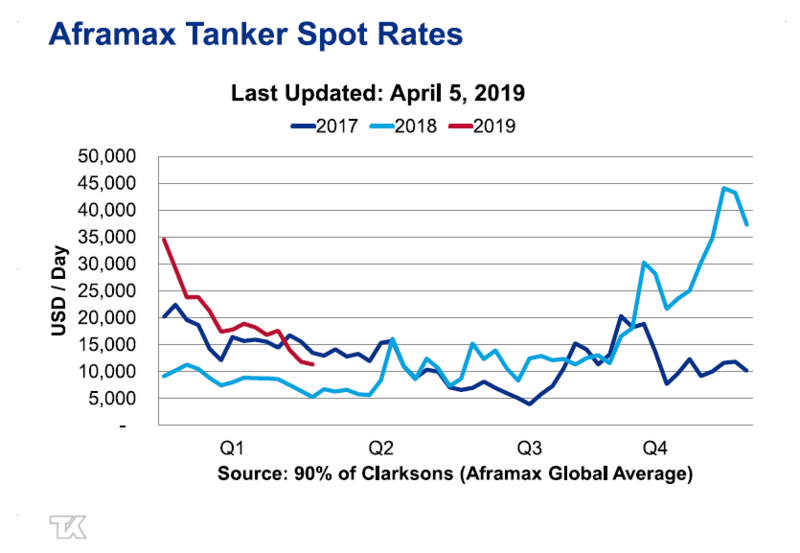 The following charts depict tanker rate trends in three major categories that partly overlap Ten Ltd.'s overall fleet: Suezmax crude carriers, Aframax crude carriers, and LR2 tankers. 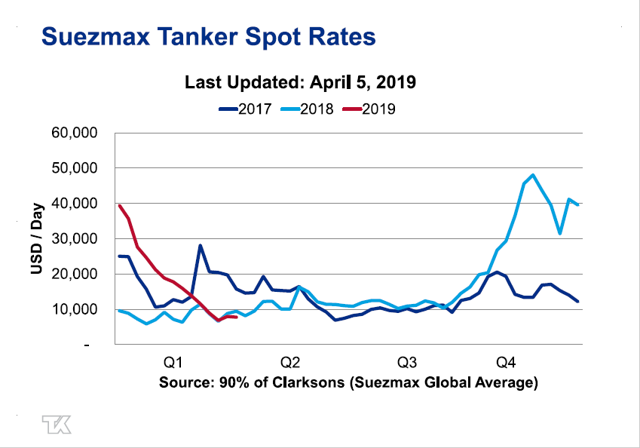 As can be seen, tanker rates have been in the doldrums throughout 2017 and the first three quarters of 2018. The last three months of 2018 witnessed a spike in rates. This spike, however, was not sustained into 2019, during which rates again flagged. This may however just be a seasonal effect, explained by refinery scheduled maintenance and other requirements. The market seems to assume that the spike in rates seen in the last quarter of 2018 was an outlier. Despite that sharp improvement in industry fundamentals, valuations of tanker companies have remained consistently depressed. However, there are in fact reasons to be optimistic about tanker rates going forward. Overall demand for oil is increasing, driven largely by China and India. 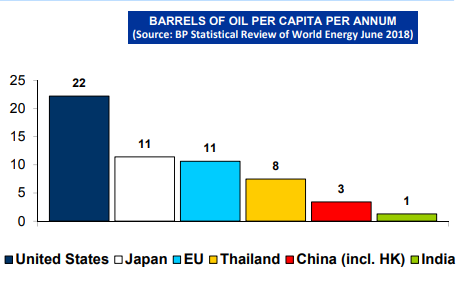 The expectation is that the per capita oil consumption by these two Asian giants will match that of other parts of the world, including other Asian countries and regions. If, for example, China achieved the levels of consumption in Thailand, Chinese oil demand (based on current population) would rise to 18mbpd, an increase of 10mbpd from current levels. The following chart illustrates the differences in current per capita consumption between India and China and certain other countries or regions of the world. Year after year, Chinese and Indian oil demand has steadily crept upwards. In 2018, China's consumption growth was +3.2% to 13.0mbpd and is expected at +3.9% to 13.5mbpd in 2019. India's demand growth in 2018 was at +4.4% to 4.8mbpd and is expected to grow by 5.0% to 5.0mbpd in 2019. In addition, there is ample supply of oil, driven in large part by the shale boom in the United States. Because of disruptions in countries such as Venezuela and new supply sources in the United States and other places, tankers are moreover having to cover larger distances to deliver the same tonnage of cargo. In addition, the upcoming IMO 2020 regulations (limiting the permissible sulphur content of bunker fuel) will require the scrapping of substantial amounts of noncompliant tonnage. Indeed, scrapping of the existing fleet is currently at historical highs. On the other hand, the order book for new vessels is at a low point. 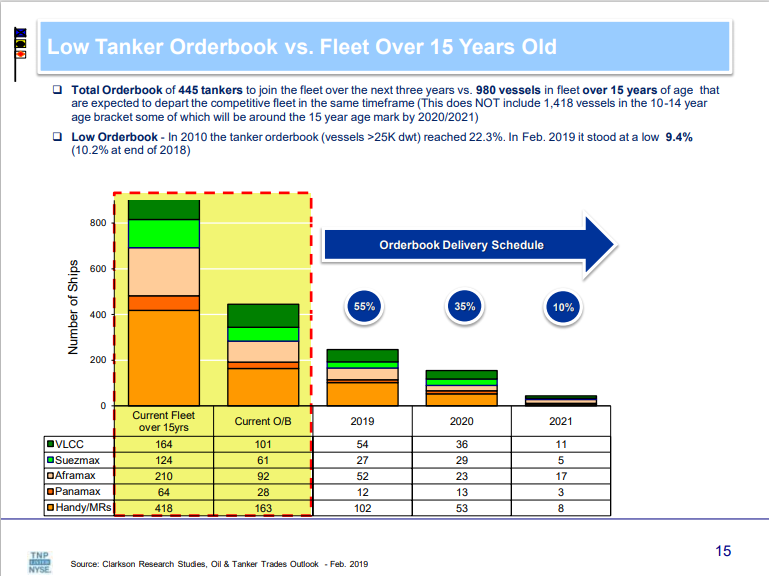 In prior years, a relatively large order book kept a lid on tanker rates. This order book overhang has substantially decreased, as can be seen in the following chart. A total of 445 new tankers are expected to join the worldwide fleet during the next three years, compared to 980 vessels expected to be scrapped. The following chart illustrates scrapping trends. It should be noted that tanker rates are highly inelastic. In other words, a small shortfall in global tonnage would likely cause a disproportionately large spike in the price for moving cargo. The low order book for tankers well into 2021 could trigger sustained elevated tanker rates. 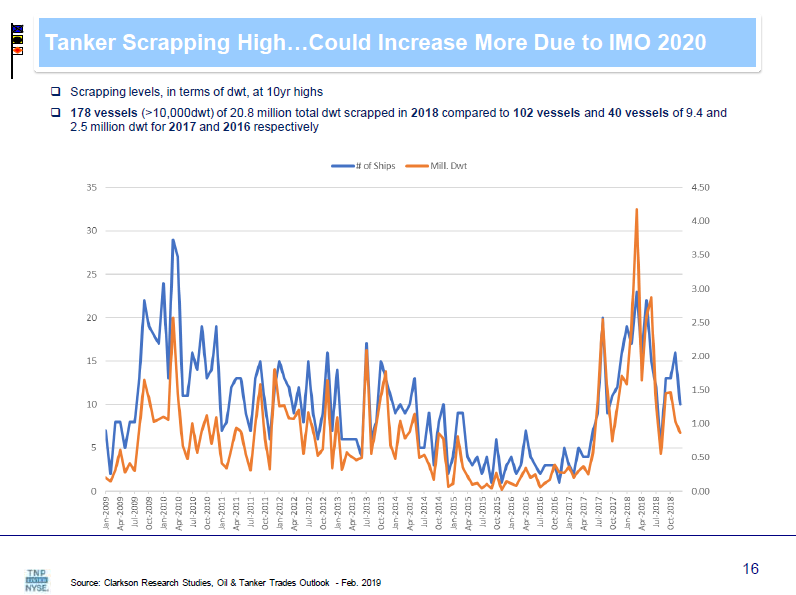 Indeed, some industry observers are buoyantly optimistic about the prospect for tanker rates. Fearnleys has a good track record of accurately anticipating tanker rates, based on available information. 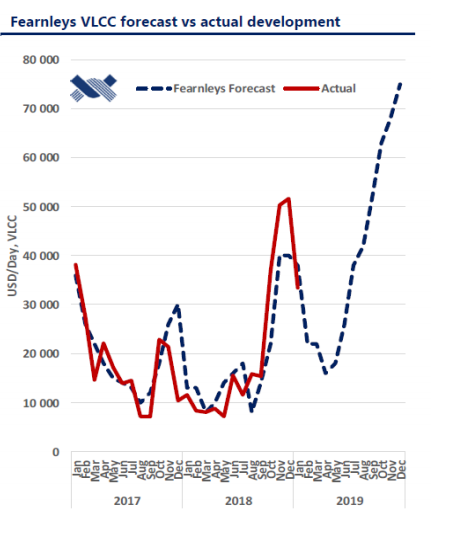 The following chart compares Fearnleys' forecasts for Very Large Crude Carriers (VLCC) tanker rates to actual rates. As can be seen, Fearnleys expects tanker rates for VLCCs to close out 2019 at upwards of $74,000 per day. If Fearnleys is correct, the tanker industry (at least in the VLCC segment) should be entering boom times towards the end of 2019, similar to what was experienced around 2007 and 2008 (when Ten Ltd.'s shares reached a high of $38.90 per share). Tanker rates of different vessel size segments are moreover highly correlated, and so if the VLCC tanker rates spike up, the Suezmax and other vessel size tanker rates should likely spike up as well. If that is the case, the industry's profits and dividend paying capacity should explode. If the equity prices for these companies during the boom a decade or so ago are any indication, an investment in quality tanker companies such as Ten Ltd. at currently depressed equity valuations could be a multi-bagger. Disclosure: I am/we are long TNP. I wrote this article myself, and it expresses my own opinions. I am not receiving compensation for it (other than from Seeking Alpha). I have no business relationship with any company whose stock is mentioned in this article.